For a long time in North America, subcompacts didn’t offer much beyond high fuel economy and a low price tag. Options sheets were limited to a few comforts such as air conditioning, cabins were utterly devoid of technology and cool wheels were completely off the menu. 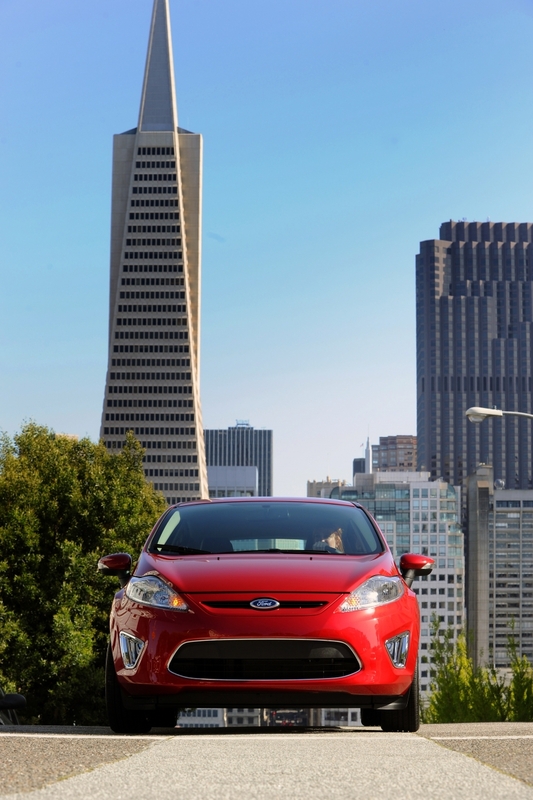 Those days are officially gone with the arrival of the 2011 Ford Fiesta. The combination of downsizers and twenty-somethings that possess no small car stigma has finally created a market for a high tech, lightweight, fuel-efficient and affordable subcompact on our side of the pond. Not that the car’s performance in Europe should be overlooked – so far it is the market’s top seller for 2010. Sometimes, however, a few things get lost in translation on the trip across the Atlantic. And if a glance at the spec sheet doesn’t convince you that little has been changed in the name of localization – a six-speed dual-clutch automatic and engine capable of 40-plus mpg will catch your eye – a quick stint behind the wheel will assure you that this is, in fact, a lithe, nimble and truly involving vehicle. What’s more, it is primarily being marketed as a hatchback, proving that truly, the game has changed. 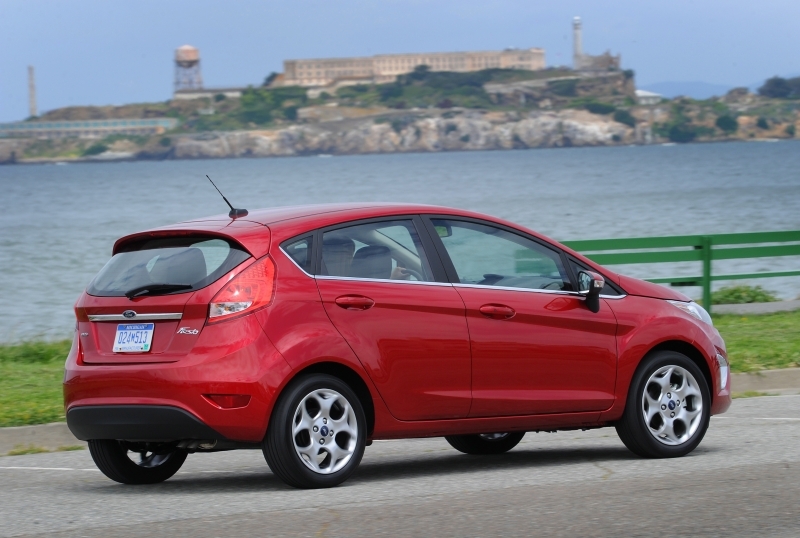 Efficiency is the Fiesta’s primary selling point, and at 40 mpg, it’s hard to argue with it, especially when you consider the low base price. Ford is also offering a lot of proper, premium technology in a small package, such as a fuel-saving dual-clutch transmission, an LCD display and voice-activated SYNC audio control. Drum brakes in the rear don’t exactly fit well with the Fiesta’s upmarket mission statement, but they do work well. No ability to select gears manually in the automatic transmission aside from Drive and Low. Lithe and full of character, the Fiesta is a great drive whether sedately cruising along or being wrung within an inch of its life. The quick helm exhibits good steering feel for an electronic power assist (EPAS) system, and the suspension is firm yet surprisingly compliant over bumps and potholes. The engine needs to be revved to make power, but the upside is fantastic fuel economy. Still, passing needs to be well planned, and a turbo version in the future would be much appreciated. Unfortunately, aside from ‘Drive’ and ‘Low’, drivers can’t select gears with the PowerShift dual-clutch transmission, which would be ok if it didn’t feel as if it were constantly searching for the proper ratio on anything but a perfectly flat stretch of road. Of course, there is a perfectly good five-speed manual available if you really want to have control over the gears, but the combination of a new, sophisticated automatic with no ability to control it seems an obvious oversight. For a small, economical car, the Fiesta is remarkably – almost frighteningly – quiet at highway speeds. The Ford Fiesta is powered by a 1.6-liter inline four-cylinder engine with Twin Independent Variable Camshaft Timing (Ti-VCT) that produces 120 horsepower and 112 lb-ft of torque. Power is driven to the front wheels via either a five-speed manual or six-speed PowerShift dual-clutch automatic transmission. Pull-Drift Compensation is a new feature that automatically dials in corrective steering when the system determines the Fiesta is drifting on the road, so when you are cruising on a crowded road or experiencing a crosswind, you won’t have to constantly hold corrective input on the steering wheel. A similar system, called Active Nibble Cancelation (seriously), compensates for vibrations caused by tire imbalances. 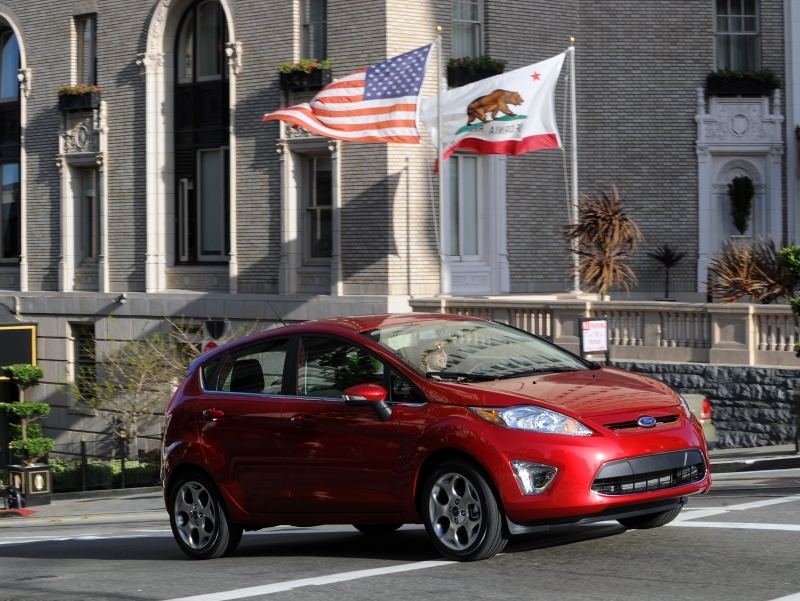 The Fiesta might be a small car, but it’s big on technology and offers tech-savvy buyers plenty of options. Ford’s voice-activated SYNC audio control system continues to impress, and can now deliver turn-by-turn audio directions by connecting with your cell phone. Push button start and Sirius satellite radio are just a few of the other technologies offered. While it might not be a hybrid or use a low-consumption diesel engine, the diminutive 1.6-liter in the Fiesta is far from being a glutton. The five-speed manual returns 29 mpg city, 38 mpg highway, and as highly impressive as that sounds, the PowerShift six-speed automatic does even better, at 30 mpg city, 40 mpg highway. 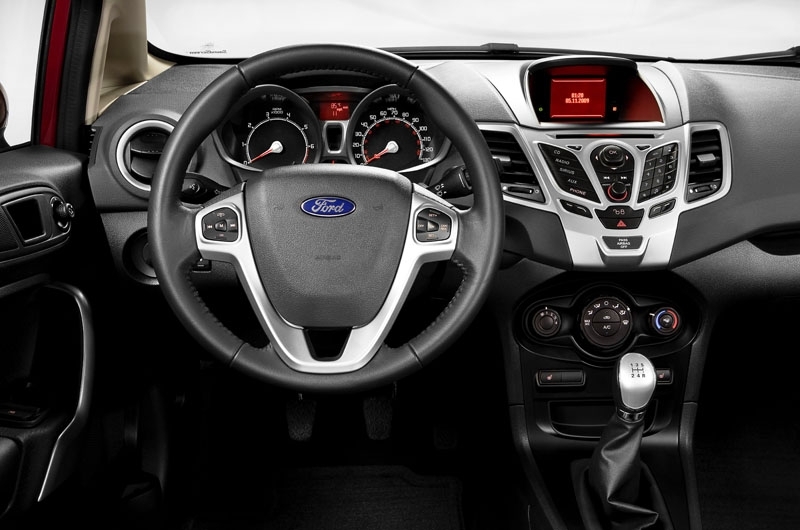 For a subcompact car, the Fiesta feels properly modern, with attractive gauges, an LCD display topping the center stack and soft-touch plastics all around. The seats are perfectly comfortable for long-distance commutes, though drivers over six feet tall, be warned – you probably won’t be able to fit any passengers in the seat behind. The Fiesta is stylish and eye-catching, thanks in part to an awesome color palette with hues such as Lime Squeeze and Yellow Blaze. Trust us, you’ll like these jelly bean-esque colors. While the sedan costs a bit less, it’s the hatch that seems to carry with it more visual fidelity. 15-inch wheels come standard on base models and 16-inch wheels are fitted to SEL and SES trims. 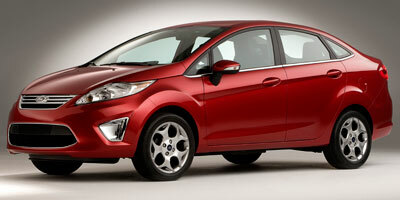 The Fiesta is a whole lot of car for a very reasonable price – $13,995 for the sedan and $15,795 for the hatchback. There are various options and trim levels available, but so long as you don’t need every superfluous feature you won’t have to worry too much about breaking $20K. Competition includes the Toyota Yaris ($12,605), Honda Fit ($14,900) and Nissan Versa ($13,350), as well as Volkswagen’s upcoming Polo. 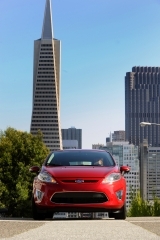 For a subcompact car, the Ford Fiesta offers a lot of typically up-market comforts and options and pairs them with hugely impressive fuel economy to create a package that hasn’t really existed up until this point in the North American market. However, we find it a more than welcome change of pace and a preview of things to come.